The above sample is still using the effects framework but that’s irrelevant. There is another problem with this approach with regards to flexibility, if you wish to swap shaders on the fly, they either all need to use the same vertex shader input layout or you need to somehow create all your input layouts in advance and then link them with the shaders you wish to load. Well, considering the fact that we use the compiled shader to actually validate the input layout then that means that the compiled shader has all the necessary information available for us to create the input layout. Basically we’re just going to reverse engineer the validation step to create an input layout based on the shader. Oh btw, before I forget to actually use the shader reflection functions you need to include the D3DCompiler.h header and link against the D3Dcompiler.lib static library. I’ve had some downtime lately and seeing as I wrote a basic shadow mapping demo, I figured I’d write a short tutorial on the theory and implementation of shadow mapping. 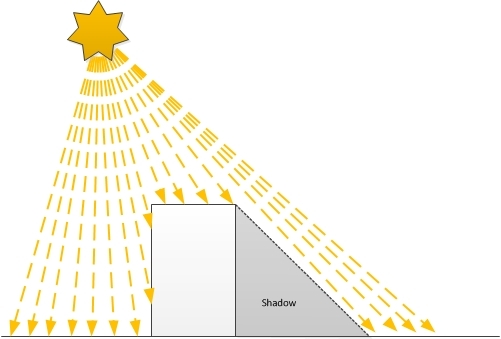 Shadow mapping is one of those topics that tends to get explained in a overly complicated manner when in fact the concept is rather simple. It is expected that you understand the basic of lighting before attempting this tutorial, if you want to learn more about some basic lighting models please read my lighting tutorial. The figure below shows a sample scene with a single light illuminating a cube. It’s been ages since my last DirectX 10 tutorial and I apologize, I’ve been buried under a ton of work and haven’t had much free time lately. This is going to be a very short tutorial on pretty much the final stage in the rendering pipeline: color blending. If you recall, each frame displayed on the screen is simply a bitmap that gets displayed and updated multiple times a second. This bitmap is called the frame buffer, now the frame buffer is technically the image we see at any given point and the back buffer (assuming you are double buffering) is what you actually draw to (referred to as your render target) and only once you finish drawing do you display the back buffer to the screen by swapping the frame buffer and the back buffer by using the Present member of the DX10 swapchain class. Since my car has been broken for the last two days, I’ve taken off work and have been working on my Masters degree, since part of my Masters involves building a small “game engine” for AI testing, I’ve been doing some more DX10 work, so its convenient for me to quickly slap together a few more tutorials. Okay so it’s been a while since my last tutorial, and I apologize for that. We dealt with textures in the last tutorial, and many of you might be wondering while I handled that so early? Well mainly because D3D 10 isn’t exactly an API designed for beginners, so a critical feature required for any scene rendering (depth testing or z-buffering) is done in D3D by use of a depth stencil texture, covering textures before depth testing makes sense in this case. Remember guys I’m not going to spoon feed you, these tutorials expect you to read the SDK docs for details on the variable types and the methods, these tutorials are just to give you a running start.